So Christmas eve is here… wasn’t Thanksgiving just yesterday? Speaking of, my life was in such chaos at Thanksgiving, I didn’t stop to think about what I was thankful for. 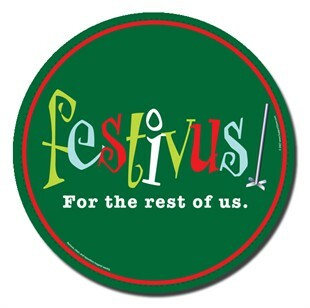 Now that things have settled out a bit, I find myself feeling grateful for small miracles, the true spirit of Festivus! Small improvements… my dad has adjusted amazingly well in his new home (a dementia facility). He is very social and actually smiles now. My sister Clare is home from Japan for a couple of months to help care for Mom until we can get her moved to a nursing home. My mom’s Parkinson’s is progressing quickly, but we’ve had a hospital bed delivered so it’s a little easier now. Home is where the heart is… although my disability income has been drastically cut and I have to give up my place, I am lucky to have my family’s home to move in to. Since the Biscuit and my ex have moved into my family’s house, I will get to spend more time with the Biscuit. Health and happiness…. I am making progress with the 9-week rehab treatment on for my neck. In six weeks, I expect my x-rays will show great improvement. My friend Bill had a successful surgery to remove a cancerous tumor from his lung. Yay! And finally, I am grateful for the warmth, love and support of the true friends in my life. What are you grateful for?